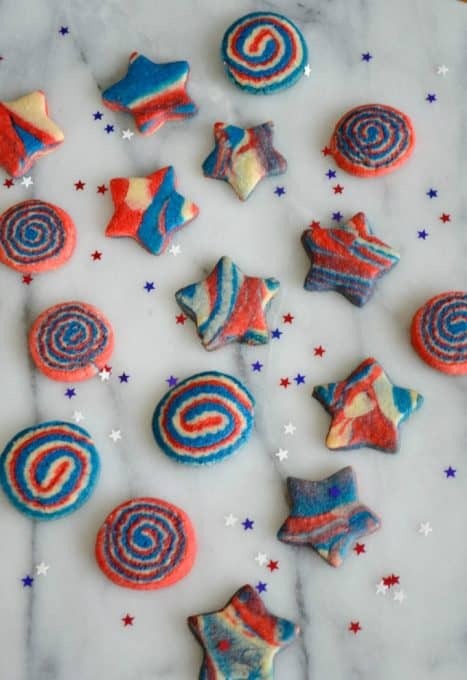 Patriotic Pinwheel and Star Cookies – one sugar cookie dough with three colors to make your Patriotic celebration colorful and festive! It’s almost the 4th of July!! I made these cookies 5 years ago and I can’t believe it’s been that long. The original post with those funny looking pictures can be found here. So, I decided to do them again, rename them, take some more recent (if not slightly better) pictures and present them to everyone on a Facebook LIVE video (which I’ll add tomorrow). You’ll notice that the original recipe I made were for White Chocolate Pinwheels, but since I really couldn’t taste the white chocolate in them, I opted to leave it out in this recipe. 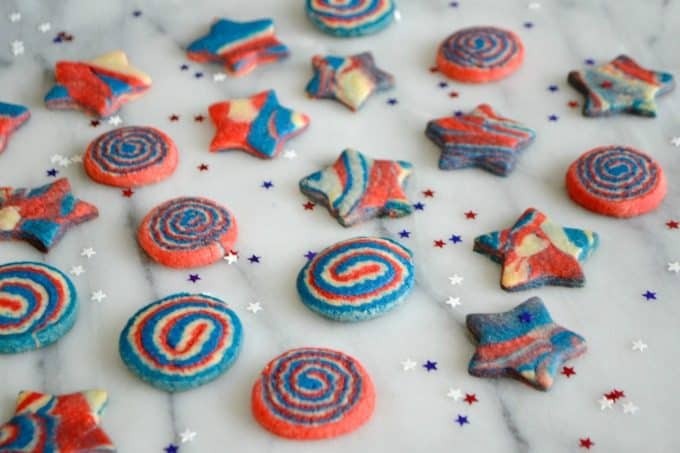 These cookies are easier than they look and I actually enjoyed making the stars more than the pinwheels. I had some leftover scraps after I cut away the dough to even out the pinwheels and of course, couldn’t let things go to waste. I rolled the small pieces together and then used the star cookie cutter I had to make the shapes. 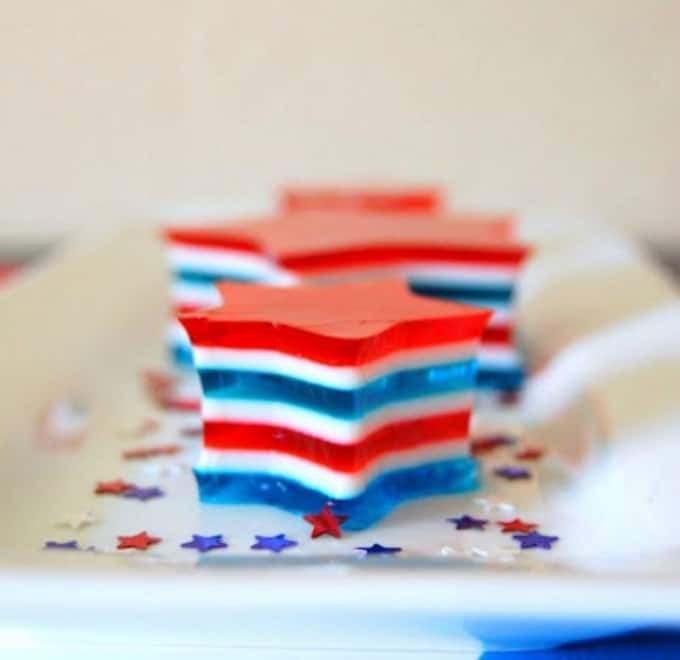 I think they turned out pretty cute and they’re definitely saying red, white and blue! This recipe is adapted from The New Doubleday Cookbook, p.837; authors, Jean Anderson and Elaine Hanna; publisher, Bantam Doubleday Dell, an imprint of Random House, Inc.; ISBN 0-385-19577-X. When placing the rolled cookie dough into the refrigerator, I found that it was easiest to store it up in a flat bottomed glass instead of laying it down. This will prevent the sides from flattening. Sift flour with baking powder and salt and set aside. Add vanilla and one egg and beat well. Add the second egg and beat until thoroughly mixed. Slowly add in flour mixture until just blended on lowest speed. Divide the dough into thirds and place into bowls. Leave one bowl with white dough. 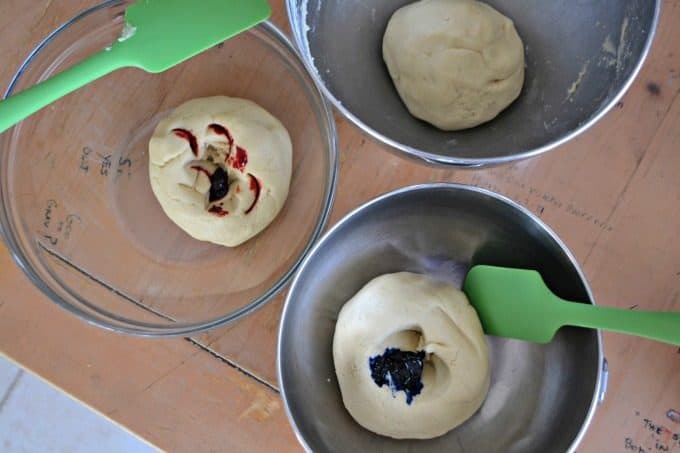 In another bowl, add blue food coloring to the dough to reach the desired amount of color. Blend in with a rubber spatula by folding the dough over itself. I actually found it was easiest to use a rubber glove and mix the food coloring in with my hand. In the third bowl, add red food coloring and blend with rubber spatula until desired color is reached. Wrap doughs separately in plastic wrap and gently pat into small rectangles as it will be easier to roll out later. Chill in refrigerator for one hour. Remove from red dough from refrigerator and cut in half. Place one half back in refrigerator and roll the other on a well floured surface into a 6 X 10-inch rectangle with ¼-inch thickness. Repeat process with the white and blue doughs. 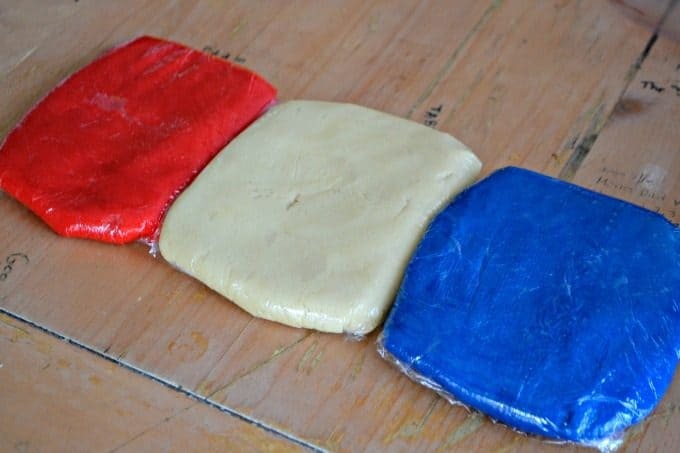 Using two spatulas, gently lift white dough and place it onto the red dough or place it onto the blue depending how you want the color order to go. Again using the two spatulas, place blue dough onto the white (or red dough onto the white if you have reversed the order). Roll the three doughs out into a larger rectangle so that it is ¼-inch in thickness. Again, I cannot tell you what size mine was, but you’ll notice I had to be careful of it falling off the edge of the counter on the right. With a sharp knife, cut away the edges so that all four sides are even. At this point, it is easiest to divide the dough in half and roll as the logs could become really long. Roll dough up jelly-roll style from the long side. Wrap in plastic wrap and place on a cookie sheet to refrigerate for ½ hour. Preheat oven to 375ºF, and lightly butter two cookie sheets. Remove remaining dough halves from refrigerator and repeat rolling, stacking, and rolling process. Roll dough up jelly-roll style from the long side and wrap in plastic wrap to refrigerate for ½ hour. Remove chilled dough from refrigerator and unwrap. Slice ¼-inch thick and place on prepared cookie sheets about 2 inches apart as they will expand during baking. Gently place the scraps of dough together and roll on a floured surface to about 1/4-inch thick. 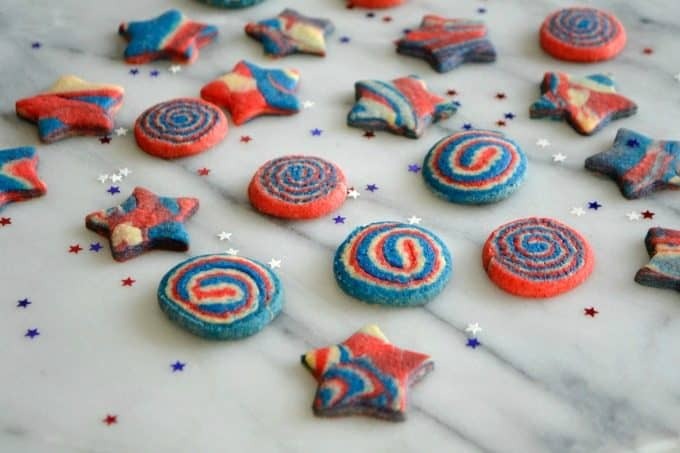 Using a star cookie cutter, make the cookies and transfer to a lightly buttered baking sheet. Bake 10-12 minutes until cookies barely show a print when lightly pressed. Please have a very safe and happy 4th of July! My first time watching and enjoyed very much! Can’t wait until Sunday. Will you be posted on Facebook or my email? I don’t want to miss anything! Thanks so much for watching, Arlene! I have a 365 Days of Baking and More Facebook group where I let people know in advance when I’ll be going LIVE. Here’s the link to it if you haven’t already joined: https://www.facebook.com/groups/1683033611948110/ . Hope to “see” you there, Arlene! Hi can u please share some eggless recipes please. Thanx ? Hi Krupa, I do have the Eggless Coriander Blueberry Bundt Cake: https://www.365daysofbakingandmore.com/eggless-blueberry-coriander-bundt-cake/ , but not too many others, so will have to work on that.